Standard Vanguard tackles 78 Alpine passes. Homepage. This page: A booklet tells the story of a Vanguard chosen to tackle 78 Alpine passes in just 5 days. Alpine trial, by Standard Vanguard. This small booklet, titled "Seventy-Eight Alpine Passes Within 5 Days", contains a feature that first appeared in Mileposts magazine, a title that has long since disappeared from newsagents' shelves. Although it doesn't say so, I assume this booklet was produced by, or on behalf of, the Standard Motor Company, to promote the Phase 1 Vanguard and its many virtues. The feature opens by saying that the roads of Switzerland were some of the most testing routes that any car could be subjected to. 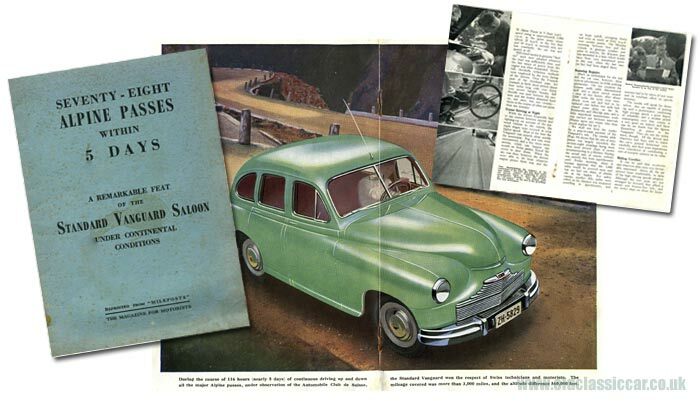 British cars, it would seem, were popular with Swiss motorists, although there was a feeling that British family saloons would benefit from a little more grunt beneath the bonnet, more interior space, and better handling, if they were to really be suitable for the testing Swiss road conditions. The Vanguard had been well received at its launch, but there were still doubts about whether this car could really hack it in the mountainous Swiss terrain. The idea of an Alpine Trial was mooted by some Standard distributors, in a bid to prove their vehicle's capabilities, and a plan was hatched by local motoring experts, one that, they say, "... should have been sufficient to tear many a car into pieces - which, incidentally, was our idea in connection with the Vanguard". One car was earmarked for the challenge, a factory-standard Phase 1 saloon car. It would have to cover a minimum of 3,000 miles and climb no less than sixty Alpine passes, all within no more than five days of driving. Three teams were assembled for the trip, each consisting of two drivers and one A.C.S. (Automobile Club de Suisse) observer. Each team had a target of 200 miles to cover in an eight-hour shift, one shift per team per day. This ensured that the Vanguard would be in continuous use for 24 hours per day in all, barring any mechanical woes. Various routes over the Alpine passes were mapped out, the base camp being located at Andermatt. An average speed in the order of 26 mph would be required, quite a stern test of any car and driver, let alone a family car. There was a feeling amongst the organisers that the car would undoubtably suffer reliability problems, and because of this publicity was minimised wherever possible so as to not impact sales of the new car. In fact the drivers allocated to take part in this trial weren't told until the last minute what car they'd actually be using. As for the drivers, they were picked based on both their experience behind the wheel, and also willingness to push hard wherever and whenever possible. Some were professional Swiss racing drivers, but sadly aren't named in this booklet. "Do not expect a tale of hardship and adventure now, dear reader, for none is to follow. The sponsors were, very soon, radiant; the drivers marvelled, and the writer was dumbfounded. After seven hours the Vanguard came back to Andermatt, having done rather better than his due, and, after a short stop for refuelling, the second team took over and went away. And this is about all there is to say. Approximately every eight hours the Standard appeared at the hotel, a short signal was heard and teams were changed after a brief stay. The circuits were made stiffer and stiffer, more passes were included and the average rose slightly but steadily." "Full throttle uphill, engine speed rising to approximately 5,000 rpm in the gears many times (about 25mph in the low first and 50mph in second) and, not less constantly, the car was not spared at all. Hill-climb tactics in genuine "Stelvio" style were adopted wherever the road was sufficiently clear, and the last ounce of power from the engine was often demanded." "When the sky was clear [at night], however, the drivers were able to let loose whatever engine power there was, and the car leapt uphill, averaging thirty and even as much as forty mph over certain passes. On Monday morning, between four and five o'clock, in glorious weather just prior to sunrise, the Klausen pass was ascended in a time which would have been very sensational prior to the war, when the last race (so far) had been staged there." Throughout the test, the Standard proved to be a reliable old girl. The earth cable on the dynamo parted company causing a short circuit, and a break of two hours while it was fixed. All the tyres had to be replaced after 2,000 miles of hard driving, and the repair of two punctures earlier in the event. Other than these minor gremlins, and some evidence of wear to the valve guides after 2,700 miles, the car behaved excellently. Of the car's interior appointments, the drivers and observers were "very favourably impressed", the car proving to be most comfortable, "in spite of the high driving speeds adopted". The rear seats provided a "steady and bounce-free ride" while the wireless radio and heater "helped to maintain a cosy atmosphere at night." By the end of this Alpine trial, the car had covered 3,182 miles and completed 78 passes. The total time for the trial was 4 days, 20 hours and 1 minute, with stops totalling 13 hours, 31 minutes in all. Average speed, including stops, was 27.43 mph. The total altitude covered, including climbs and descents, came to 563,805 feet. What became of Phase 1 Standard Vanguard registration number ZH 5829? No mention of its fate is mentioned in this article. Did it go on to promote the model by being displayed in Swiss dealerships? Perhaps it was shipped back home to Coventry for evaluation by its manufacturer. More items of paperwork, such as booklets, leaflets and similar motor-related ephemera, can be found in the Motoring Collectables section. To find other Standard-related items on the site, try the "site search" facility at the foot of this page.